Madder, Rubia tinctorum, is the source of a fine toned red dye, variously called alizarin, red alizarin, madder red or Turkey red. Used to colour fabric and timber, particularly violins. Important planting in medieval gardens. Unusual growth habit. Madder is native to southern Europe. 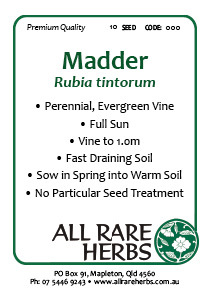 prefers light textured, well drained soils in a protected, part shaded position. Frost resistant but drought tender. Full sun. Climbing evergreen perennial to 1m. Be the first to review “Madder, seed” Click here to cancel reply.